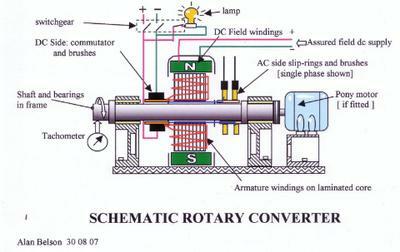 Does anyone make a direct mechanical brush to slip ring type 3-phase rotary converter to convert from DC to 3-phase AC? If I'm understanding you correctly, you are talking about something like this, a rotary DC-AC three phase converter, and the short answer is I don't know; this is a little bit outside my scope, honestly. I looked around a little and couldn't find that anyone is actually manufacturing them, but if anyone hears differently please leave a comment. Sounds like something you might be able to build yourself, though. "Manufacturing of these converters is very simple. Commutator with two segments on each phase is manufactured using technologies from commutator DC motors, slip rings using technologies of slip rings from three phase AC induction motors with rotor winding. Price of segments or slip rings used in the rotary converter is small compared with electronic components and can be obtained at a small cost from refurbished materials."